Mac Daddy IT Ltd offer a hosting service that puts the power of Mac Daddy IT Ltd Mail and Mac OS X Snow Leopard Server into the cloud! Enjoy the benefits of Mac OS X 10.6.8 server services, without the expense and commitment of purchasing, installing, configuring and maintaining the server yourself. Your domain's email and optional web site can be hosted on our fast, dedicated server. For a small admin fee you can either get us to maintain your email (administering email addresses, for example), or you can choose to manage it yourself - all accounts come with full cPanel access. With Mac Daddy IT Ltd hosting, you're not sharing server resources on a public cloud service, such as iCloud or Googlemail with millions of other users. With Mac Daddy IT Ltd hosting you get blazing fast services for your mail, calendars, address book and wikis, you also get the same benefits such as synchronised shared calendars, notes, address books and more. Unlike Microsoft Exchange, there are no expensive additional account subscription charges. With 15GB and above packages from Mac Daddy IT Ltd hosting you get unlimited calendar, email and address book accounts at no extra cost. £3 + vat per GB of storage per month, up to 15GB. All calendars can be synchronised with any Apple Mac, iPhone or iPod (running Mac OS X 10.5, 10.6,10.7 & 10.8 or iOS 5 and above). Each staff member can have their own calendar, as well as any number of company-wide calendars. Hosted Mac Daddy IT Ltd mail comes with Address Book Server. This gives you synchronised address books on a user level as well as company-wide. It syncronises with all Macs (MacBooks, MacBook Pros, MacBook Airs, iMacs, Mac Pros running 10.5, 10.6, 10.7 or 10.8), iPhones, and iPads (running iOS 5 and above) as well as through the web. Add a contact on your iPhone on the go, and it's already updated on your iMac, as well as across the office if you wish. You can also access the company's contacts and calendars over a standard web browser. This can be useful for giving PCs the ability to share and update company data without owning or running a Apple Mac. 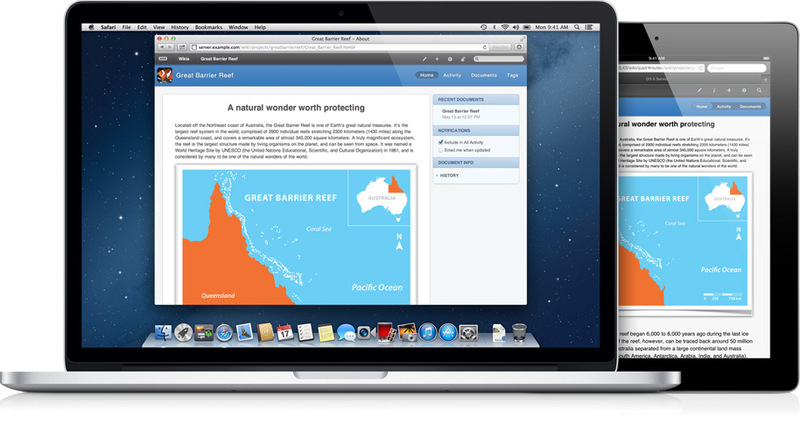 OS X Server makes it easy for groups to collaborate and communicate through their own wiki-powered website. With simple yet powerful tools, users can create and edit wikis and individual pages, tag and cross-reference material, upload files and images, and create tables and add comments. The wiki is accessible from a browser, so anyone can access it anytime. Users can easily search for new pages and content, show recent activity and view attachments with Quick Look. Whenever a page has been updated or new comments have been added, everyone receives an automatic email notification. Wiki Server is optimised for iPad. And with WebDAV support, iPad users can now open and save attachments from the wiki in Pages, Numbers and Keynote.